I travel a lot. Last year I spent 132 nights in a hotel. Being an startup founder you always have to find new ways to save money. I've found a few travel hacks that I would like to share with my weekend readers! Traveling from San Francisco to New York City during the peak travel season this summer? Don't break the bank - enjoy these travel hacks that will save you big bucks in two of the most expensive cities in the country. Here's how I planned my 5-day trip with airfare, lodging, transportation, and food, for under a grand ($902.40). Lyft's newest service taps unused seats from commuters looking to offset expenses, rather than profit seeking drivers. I discovered this hidden gem of an option by using the Up Hail app. Up Hail searches through all available service options and promos from Uber, Lyft, Yellow Taxis and other modes of ground transportation, in any given city across the country. My initial assumption was that UberPOOL and Lyft Line would be the cheapest, which would have netted out to be $30 from my origin of Fisherman's Wharf to OAK. 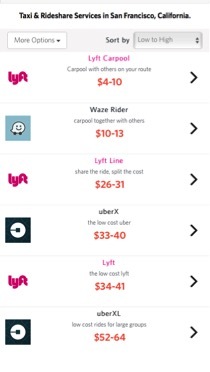 Lyft Carpool turned out to be an incredible bargain compared to the cost of the BART from Downtown SF to OAK at $10.20. The Hack: Spirit Air, the only option I found for under $500, round trip. You can sometimes find deals on airlines traveling on weekdays. If you can withstand the layover (Spirit does not offer direct flights for this route), Spirit was the only airline I was able to find that surfaced a sub-$500 round trip fare for this journey. 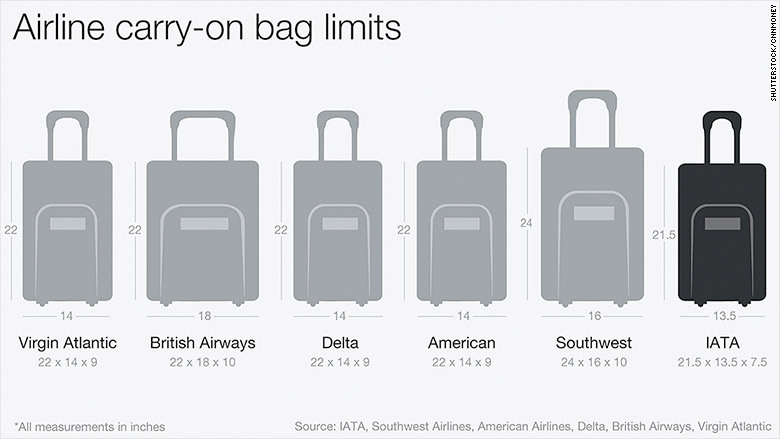 The no frills airline will charge extra fees for carry ons larger than a backpack; you may want to ship luggage to your destination. I took just a backpack, but Shipgooder is a handy shipping rate calculator (for example, a 40 lb box from SF to NYC costs $67 via Fedex Ground, compared to $71 for UPS Ground). Head over to your nearest Walmart or big box store for a free box, and stop by the post office for free USPS branded masking tape. If you do opt to take your oversize luggage on board, be sure to prepay the baggage fee online at booking to avoid paying Spirit up to $74 extra at the gate. On board, Spirit charges for everything from water to toilet paper, so be sure to bring an empty bottle and fill up at a water fountain in the terminal. If you're lucky, a fast food spot might give you a free cup of iced water, or charge you 50 cents, as did Carl's Jr. did on my journey. Still a bargain compared to the $5 you'll be gauged at both the terminal and on the plane (kudos to both for profiting off of TSA safety restrictions). There is no wifi on board, but you can download movies to store on your laptop or phone ahead of time. Don't fork over your cash to iTunes - check out this list we found of 40 free legal movie download classics. The Hack: Carmel Limo with their $30 flat rate private ride from LGA to anywhere in Manhattan. I initially thought Lyft Line or UberPOOL would have been the winner, but again, Up Hail surfaced a deal from my origin of LGA to destination of Wall Street. Carmel Limo turned out to be a few bucks cheaper than the shared ride, and possibly much cheaper if surges were in effect or traffic heavy. Tell your driver to take the 59th Street Bridge to avoid hefty tolls. Tipping the driver is optional but customary (I gave $3 each way). Carmel has an app which allows for pre-booking (unlike Uber at the moment; Lyft just started testing this feature) and does not surge during peak times. Of course, if you don't mind wasting half a day in traffic, you can take a local NYC bus from the airport for only $2.75. Carmel app offers pre-arranged rides - screenshot from the Google Play store (iOS also available). Anyone who has ever lived in the NYC Metro Area knows that the deals are to be had just across the Hudson River in New Jersey. Cheaper gas, lower sales tax, and of course lower housing and hotel costs. Public transportation options such as the PATH train make it easy and quick to get into the City for only $2.50, and I don't mind staying an extra train stop away to save big bucks. No hotel, hostel, or even campground for that matter could ever match the deals to be found on Airbnb. The PATH services a few towns in NJ: Jersey City, Hoboken, Harrison, and Newark (other towns can be reached via NJ transit trains, which are considerably more expensive), and travels to the World Trade Center, and up 6th Avenue to 33rd Street (Midtown/Herald Square). I was able to find a clean shared room for $21 a night in Jersey City, advertised close to the PATH station (private rooms were available for $53 a night). Many Airbnb listings don't disclose the exact address, but they do plot the location on the map. Before booking, I zoomed in to find the street name and cross street (Laidlaw and Baldwin) and plugged it into Google Maps directions search. Discovered it was only a 12 minute walk to the PATH, and less than 20 minute train ride to my Wall Street destination. I plugged the location into Neighborhood Scout to learn more about the crime stats and neighborhood characteristics, relieving my concerns about the possible sketchiness of the area. 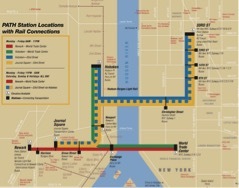 Map of the PATH subway line from NJ to Manhattan. My father likes to go to Costco on weekends to fill up on free samples. If he is feeling heavy in the pocket, he would shell out $2.45 for the hotdog and free refill soda combo (never to leave with an empty cup, nor ice to take up precious soft drink space). Fortunately, there is now a Costco in Manhattan, where you can eat at the food court without a membership (you can also get into the store membership-free with a Costco gift card). For those who don't want to shlep up to 116th street, we found this website called Real Cheap Eats that plots all "The best dishes in New York for $10 or less" on a map. We also found this list of all the pizza places in town that offer slices for less than a buck. 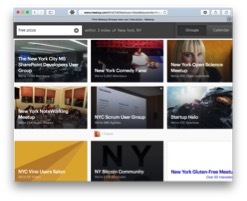 For the more adventurous and eager-minded, search Meetup or Eventbrite for "free pizza" or "free food" to surface events where sponsors are picking up the tab. Our search yielded a choice between a Bitcoin meetup, a few programming ones, and a board and table game group - all on the same evening in the Midtown area. Meetups in Manhattan offering free pizza. Fired up the Up Hail app once again to discover multiple ways to zip across Manhattan on the cheap. It tells me that the current Subway fare is $2.75 per ride (unfortunately there is no unlimited day pass), which is usually the best bet. 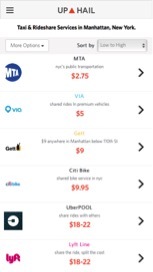 For certain parts of town that are not serviced well by subway (most notably, east of Lexington Ave.), rideshare up start VIA offers an amazing deal of $5 shared rides anywhere in Manhattan below 110th Street (Uber is now matching that rate during rush hour). Gett (the third largest ride-hailing company in the US, with a recent raise of $300 million from VW), offers an amazing $9 flat rate deal anywhere in lower Manhattan for a solo ride - which is less than half the cost of a shared UberPOOL or Lyft Line (except during the rush hour promo). I also discovered that for a flat $9.95 a day, I could rent a Citibike for 24 hours to cruise around town (Manhattan is relatively flat compared to SF). It saved me tens of dollars, and gave me a nice workout. Transportation options from Wall Street to Columbus Circle, courtesy of Up Hail. There you have it folks - my trip from SF to NYC and back for under $1,000. Did you use a travel hack or have tips for travelers looking to save money? Please share them with us!